How will it be powered is anyone’s guess right now. 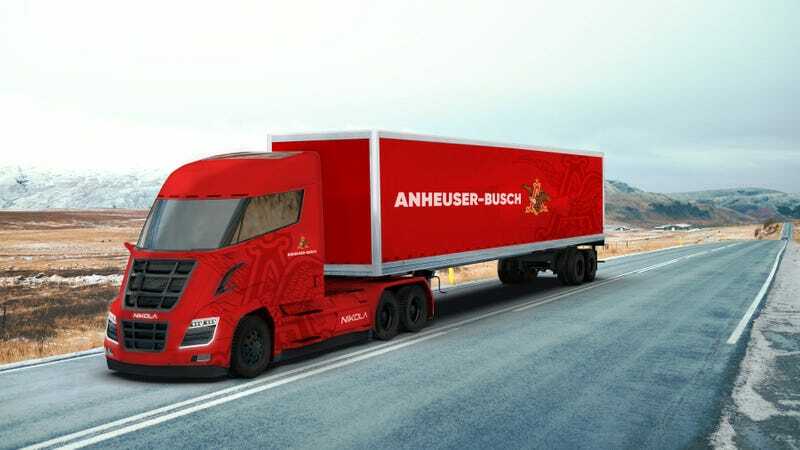 Just days after filing a $2 billion lawsuit against Tesla for allegedly lifting the design of its own semi, startup Nikola announced with beer maker Anheuser Busch that it’ll purchase “up to” 800 hydrogen-electric powered semi-trucks from Nikola. The deal is, perhaps unsurprisingly, light on specifics. Anheuser-Busch also has 40 Tesla semis reserved. So, now both Nikola and Tesla—while dueling in court—will be racing to beat each other in delivering their trucks first to Anheuser-Busch. Surely, that’ll be fun to watch play out. Nikola drew the ire of Tesla CEO Elon Musk on Wednesday for filing its lawsuit, so the startup’s probably thrilled about the timing of the deal with Anheuser-Busch. The brewer said it’s pursuing the hydrogen route as part of an effort to convert its entire dedicated fleet to renewable power by 2025. The trucks will have a range between 500 and 1,200 miles, the companies said in a press release, and they’ll be refilled within 20 minutes. The first batch is expected to be integrated into Anheuser-Busch’s dedicated fleet starting in 2020. But there’s a few key questions left unanswered here. For now, there’s no plans to show off the trucks until later this year, a Nikola spokesperson said, when the first Anheuser-Busch trucks will begin testing. “We will show them off then,” the spokesperson told Jalopnik. The broad range of “up to” 800 is notable, too, whatever that means. What’s more, how the companies plan to actually charge the semis isn’t known. Hydrogen charging infrastructure is currently thin as it is, so some sort of investment will be necessary. The companies say they anticipate building over 700 stations by 2028.